Dit dramatische appartement heeft een fantastische hoekligging en een eigen dakterras dat optimaal profiteert van het uitzicht op de Golf en het spectaculaire Pointe Santo-terrein en de lagune. Volledig gerenoveerd en professioneel opnieuw ingericht tot luxe normen. Compleet met alles inclusief een volledig uitgeruste keuken, vier flatscreen-tv's, dvd / cd-stereo en wasmachine / droger. De woonkamer heeft een HD-plasma-tv, een Bluray-disc-speler en een Bose Surround Sound-systeem. De master suite heeft een kingsize bed, bubbelbad en dubbele inloopdouche. De suite beschikt over twee grote bedden en een inloopdouche. De kantoorhoek heeft een pc met een flatscreenscherm en kleurenprinter, een kabelmodem voor snelle internettoegang en draadloze en bedrade verbindingen voor gast-pc's. De tropisch aangelegde tuinen van Pointe Santo omvatten een zwembad, een bubbelbad, tennis, gasgrills en een scala aan bemande kinderactiviteiten. Met een van de beste stranden van Sanibel, is het de ideale locatie om te genieten van de Golf en schelpen te verzamelen. Het ligt dicht bij verschillende golfbanen, evenals fantastische restaurants, winkels, varen en vissen. Sanibel Island is de ideale vakantiebestemming voor gezinnen. 40 kilometer fietspaden doorkruisen het eiland en lopen vlak langs het Pointe Santo-complex. Het beroemde 'Ding' Darling Wildlife Refuge is in de buurt. Bezoek onze website onder 'Links naar meer informatie' hieronder om meer foto's, beschrijvingen en plattegrond te bekijken. Liever een Beach-Level Condo in Pointe Santo? Zie VRBO # 170782 voor onze luxe flat op het strand. Prachtige granieten keuken, fantastische locatie aan het strand, nieuwe tropische meubels, pc & printer, flatscreen-tv's en nog veel meer! Je wilt niet weggaan. 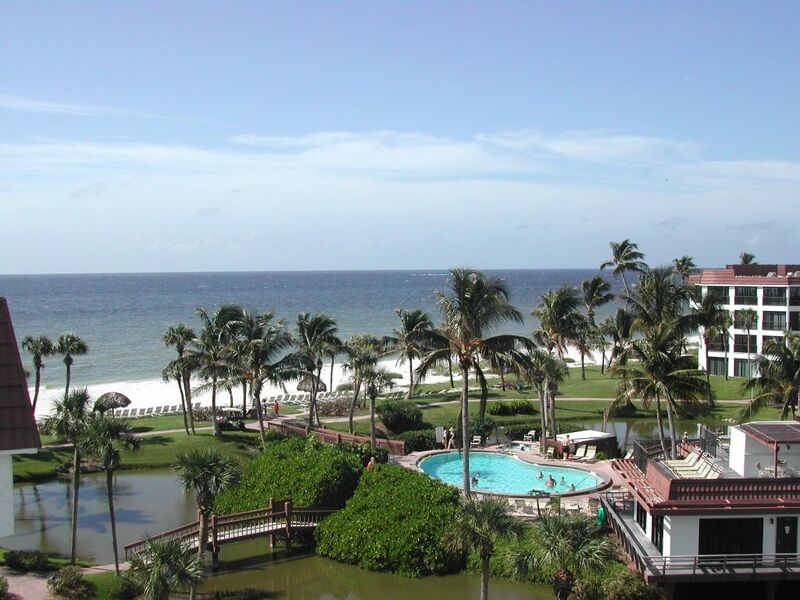 Wonderful condo with everything you could possibly need + an amazing ocean view!!! This condo is absolutely fantastic! First, let's start with the location. It is in a great spot on the island, a quick 3-5 minute drive to the grocery store, restaurants and shops. The property itself is lovely and well maintained - beautiful grass and flowers, a fun lagoon in the middle with bridges that lead to the pool, which my kids couldn't get enough of. Just steps from the pool is the gorgeous beach with tons of space and shells. My daughter especially loved the shell washing station! The walk to the pool and beach from the condo is no more than a minute - so convenient and easy. In terms of the condo itself, the designated parking spot for the unit is right next the path that leads to the elevator - not even a 10 second walk which was so nice after a long flight with tons of luggage! We were so pleased when we walked into the condo. It is so well appointed, clean and comfortable. The kitchen has a huge island and tons of cabinet space. There is at least one of everything you could possibly need to cook - high grade appliances, three different coffee makers, a blender, rice cooker, tons of pots and pans, a slow cooker and every cooking utensil you could want. The use some/leave some shelf was great - had every spice we needed, even coffee, tea, etc. The unit had dishwasher pods, trash bags, dish soap, hand soap, laundry detergent, paper towels, toilet paper, etc. You don't need to go shopping for anything for at least a few days, if at all. The dining room table is lovely, plenty of space. The technology nook was great to have and very convenient. The living room was very comfy, nice big TV and good couches. The Master bedroom was very spacious and comfortable - great mattress. And the master bath was huge with tons of storage. The second bedroom was a good size with a huge TV, which my kids loved. Also good mattresses. They had a bathroom that connected to their room which was very nice. The balcony was fantastic, with a great view of the pool and the ocean. In the corner they had tons of beach stuff including Tommy Bahama chairs and an umbrella, beach toys, skim board, boogie board, nets, etc. The unit also had tons of good beach towels inside. The roof top deck was such a nice addition. I loved having coffee up there in the morning, unbelievable view. Dave the owner was fantastic to work with. He was so responsive and helpful - both before and during our trip. If I could give more than 5 stars I would! The condo was very comfortable and a great home away from home for our first visit to Sanibel. The kitchen is really fully stocked and the "take some, leave some" cupboard very useful! There are plenty of towels (regular and beach), and a nice range of beach items. Our family of three includes an almost-five-year-old, and we appreciated that there were beach toys for shelling and playing. The pool in the complex was nice and not overcrowded any of the times we used it. We loved the direct access to the beach and spent a lot of our time walking, shelling, and swimming in the Gulf; we also loved being able to see the ocean from the lanai, and saw a couple of great sunsets from the nicely furnished rooftop deck. Another nice perk was access to Netflix on the TV. Due to several factors -- our child coming down with an illness just before we traveled (we made several trips to CVS on island and in Fort Myers proper, had to do a virtual doctor visit, and it took awhile to chase down a prescription) and meeting up with friends and family who were also in the Fort Myers area during our visit -- we didn't end up with the time to participate in the condo complex activities, but were sorry to miss out because they sounded like fun. On our next visit, when our kiddo is a bit bigger, we'll definitely rent bikes and make use of the extensive bike trails on island. We appreciated good communication from the owners before our arrival and the extensive information about the property on their website. We also appreciated prompt assistance from the property manager when we had trouble keying in when we first arrived and to address a visitation from the local insect life. We would definitely stay again!